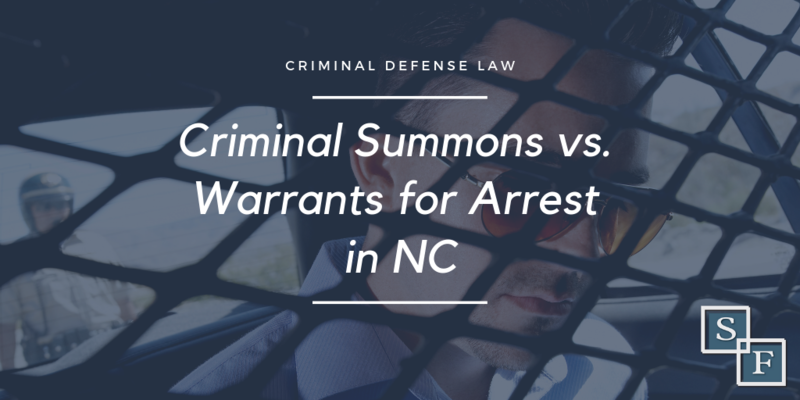 Being served in NC can have a serious impact; in this post, we’re breaking down the difference of criminal summons vs warrants for arrest. North Carolina is a unique state which allows local judicial officials to issue citizen-initiated warrants. This means that a citizen can go down to a local Magistrate for example, explain to them what happened to them, and then issue a warrant for someone else’s arrest based on the facts. However, in recent years we have seen the law change and judicial officials lean towards issuing more summons then arrest warrants. The first reason for the downturn in warrants issued is because the legislature has changed the requirements in getting a warrant issued. The legislature now requires that the facts being alleged must be in writing, both for summons and warrants. However, for a warrant, there must also be corroborating evidence from a sworn law enforcement official or a disinterested witness. The new law also requires that the warrant be issued only if the judicial official finds that investigation by law enforcement will cause a substantial burden on the complainant. The judicial official must also take into account several factors including but not limited to failures to appear, flight risk, and the risk of imminent danger. The legal change has several different effects that likely have caused the uptick in summons over warrants. The written affidavit that must be submitted can have its limitations because some are not equipped to fully explain, through writing, what exactly is going on. Another issue is getting corroborating evidence; often, law enforcement is not around during the incident. Also, utilizing a disinterested witness is also difficult as it is unlikely that someone would volunteer to come forward and support the claims. Each type of process has its benefits and drawbacks. Summons are quick, easy ways to help law enforcement investigate incidents that they did not see or could not have seen. It is way to protect the public by creating a court date and allowing for fact finding to occur. Summons also, and most importantly, help you avoid being arrested and processed. Summons can be served on defendants merely by going to the Sheriff’s office and being handed a piece of paper with the charges alleged and a court date. One of the drawbacks is there are occasions when the victim could require extra protection and jailing the defendant may have been a more serious warning to the defendant. Warrants are a good option because they can serve as a quality deterrent because when the defendant comes in, they are arrested and processed. As with summons, the defendant is given a court date and, of course, is allowed to defend themselves against the charges levied against them. However, there is also the chance that a bond could be placed on a defendant, and, for some defendants, they cannot afford to be bonded out and could spend excess time in jail for non-serious crimes or a crime they did not commit. Time will tell if the new trend towards summons will be beneficial for both the public and attorneys alike. Until then, whether issued a warrant or summons, you should immediately consult an attorney before taking any additional action. An attorney can walk you through the process of what needs to be done on your behalf. An attorney can also aid in early intervention when it comes to investigating summons and also getting a bondsman on notice to allow for a smooth transition through the process. Traumatic Brain Injury – What can I do if I have a traumatic brain injury? How Does a Cheating Spouse Impact the Divorce Process and Alimony? No information that you obtain from this web site is legal advice, nor is it intended to be. You should consult an attorney for individualized advice regarding your own unique situation. No attorney-client relationship is formed between SeiferFlatow, PLLC Office and you by viewing this web site.